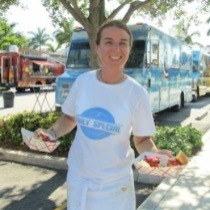 Prior to arriving in Key West 10 years ago, Chef Rebecca White, worked at Legal Seafood and was the Owner/Chef of The Yellow Dog Grille in Boston. In addition, Chef White was the personal assistant and chef for celebrities in Los Angeles, New York and London, working for A-List celebrities such as Claire Danes, Naomi Campbell and Kate Moss. In Key West, Chef White founded a new restaurant, Gusto, focusing on fresh, wood-fired grilled foods, pizza, and small plates. Most recently, Chef White was appointed the Culinary Director and Executive Chef of Kelly's Caribbean and Kelly's Catering.